The difference between aluminum and copper wire is largely in their usage within utilities, resistance, conductivity, weight and cost. Aluminum is in use by the utility companies for the transmission of electricity since the early 1900’s. Aluminum seems to have more advantages over the older copper wire in terms of weight, flexibility and cost, as it is lighter, more flexible, and less expensive. Aluminum wiring was preferred over copper wiring largely due to the rising factor of the price of copper, and therefore, aluminum wiring was economical. Aluminum alloy building wires, called the 800 alloy, is also used for low voltage feeders, saving on costs when compared to copper, which is also significantly heavier in weight as well. Aluminum building wires have half the weight of copper, with 50% greater area than copper to carry the same current, but aluminum wires need a larger wire gauge than copper to carry the same weight. Increased copper prices have also given rise to the use of aluminum wires during the 1970’s. Aluminum wiring can be just as safe as copper if properly installed, as aluminum wiring is unforgiving in the case of improper installation. Aluminum wiring has the ‘cold creep’ phenomena, as when it warms up, it expands, and it contracts when cooled down. It is unlikely for copper to lose tightness like in the case of aluminum. Aluminum oxidizes and corrodes when in contact with certain types of metal, whereas copper is safer and also more fireproof compared to aluminum. Aluminum and copper wire can also be connected together, but this needs to be handled with extra care, because if the wires are not connected together using special crimp devices, or anti-oxidant grease, they will catch fire once the conductor is heated. In order to reply to the question that if aluminum wiring is as good as copper wiring, we reply negative. Aluminum wires have potential hazards, and that is aluminum’s reactivity with the oxygen in the air which can cause a connection to overheat and fail, and possibly causing a fire. Due to this risk factor, copper wires have again taken the place of aluminum, despite the fact that aluminum is cheaper. One can also compare the weight and color of the two conductors. Copper wire is heavier, and aluminum is lighter and silver grey. The other main difference between copper and aluminum wires is the resistance of the material. Aluminum and copper are both the most commonly used conductors, with positive and negative characteristics. Copper not only has a higher conductivity than aluminum, but is more ductile, with relatively high tensile strength, and can be soldered. Aluminum has less conductivity, about 60 percent of copper, but its lightness enables it to make long spans possible. 1. Aluminum wires are corrosive and can cause fire. 2. Aluminum wires are coated with special grease and wiring devices to prevent any accident due to heat. 3. 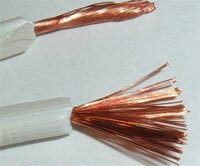 Copper wires are tensile and higher in conductivity than aluminum, which is also less ductile. 4. Aluminum wires are lighter than copper and make long spans possible, whereas copper wires can resist more than aluminum, and can be soldered. 5. Aluminum wires expand in high temperatures and contract in low temperatures when compared to copper, which can withstand thermal changes. Jilani. "Difference Between Aluminum and Copper Wire." DifferenceBetween.net. April 12, 2010 < http://www.differencebetween.net/object/difference-between-aluminum-and-copper-wire/ >. 1 sq mm of copper is 2.5 A….got it lava KUMAR??? Which conducter have high resistance copper or aluminium in same thickness and same length.